A young Andrew’s donkey, and a snowman from Florida. A cute little puppy, and a big fluffy Santa. Simple holiday treasures all dangling from strings. These are a few of Eloise Lovell’s favorite things. “My Christmas Treasures,” is the centerpiece Lovell created for her display. She used her own ornaments and decorations to make the piece. Each of the accessories has special meaning, she said. As an example, little Andrew, her first grandson, gave her the tiny donkey when he was 7 – he’s a grown man today! Another ornament with special meaning is a colorful snowman hand made by a girlfriend in Florida. Other mementos are a Christmas photo of her daughter, a horse ornament from another daughter in memory of a fall horseback ride, and her mother’s soft, green Christmas tree. Big fluffy Santa comes out every Christmas, too, to greet all who visit the Lovell home, she added. This year, a cute little pup from another horse lover is the newest member of the Christmas family. Of course, Christmas wouldn’t be complete in the Lovell household without the nativity cross – ’tis the reason for the season. Other artwork in Lovell’s display also express the holiday spirit. Lovell said she has had a lifelong interest in art, and in 2010, she started experimenting with different media and techniques. One of those techniques is tangles. She used her drawings as meditation and later decided to teach classes to introduce others to the enjoyable hobby. A more recent technique has been “plein air,” which means painting on location rather than in a studio, Lovell said, adding that the Impressionists were plein air artists. In 2010, when she began painting, she participated in several plein air shows in Arizona, including one at Bisbee on the Mexican border. “That experience was awesome!” she added. Lovell also is a member of Wabash Valley Art Guild and an associate member of Covered Bridge Art Association in Rockville. 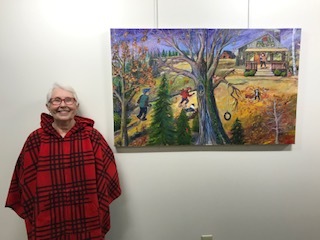 In addition to her library exhibit, she has a painting in the smallart2018 show in Arts Illiana Gallery in Terre Haute. For more information on Lovell’s artwork or to schedule a tangles class, email eelovell@gmail.com. 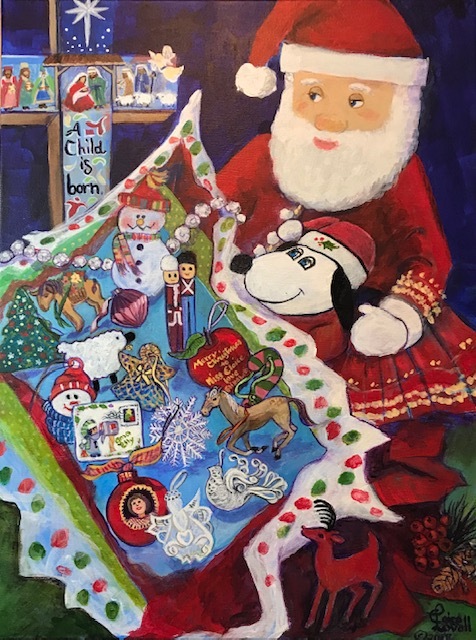 This entry was posted in Artist of the Month and tagged "Indiana, Arts Illiana Gallery, Christmas, decorations, drawings, greeting cards, holiday, holiday spirit, Impressionists, nativity, ornaments, paintings, Parke County, plein air, River City Art Association, Santa, smallart2018, snowman, tangles, Terre Haute, treasures. Bookmark the permalink.